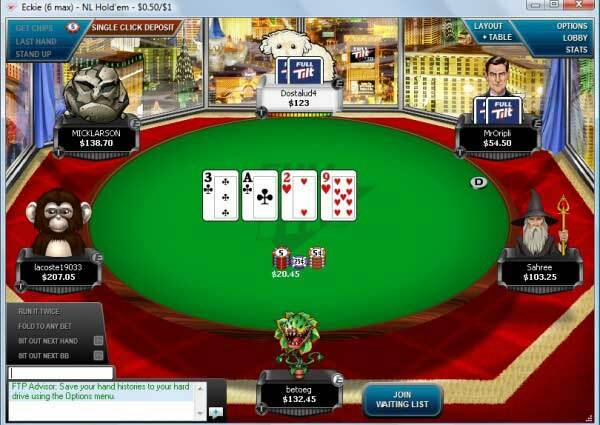 We show you How-To do Full Tilt Poker! To download & install Full Tilt Poker, watch the video above or follow the directions below. 1) Visit FullTiltPoker.com using the links on this page. 2) Click on the red Play Now! button to start the Full Tilt download. 3) Click Save File and the file will start downloading. It should be finished in about 30 seconds or less. 4) Double click to open and select Run. 5) Select your install language, accept the terms and click Next a few times. 6) In a few moments, Full Tilt will be installed. Press Finish to launch Full Tilt Poker. And that’s it – you now have Full Tilt Poker installed on your computer! Continue on where we show you how to create your account & make a real money deposit. Once installed, you now need an account to play at Full Tilt. 1) Click on Create New Account when opening the Full Tilt software. 2) Choose your Player ID – This is your username and can never be changed, choose wisely! 3) Create a password, and enter your e-mail address. Check both boxes confirming your age and the terms, then press Sign Me Up! 5) You now have your own Full Tilt Poker account! Don’t lose your login information, you will need these to login each time you want to play. Now that you have an account, it’s time to make a deposit to get in on the action! So you want to play for real money? Let’s gamble! 2) Choose your deposit method from those listed. We recommend trying Visa or MasterCard, you can use any Credit, Debit or even Prepaid card. 4) If this is your first deposit, you will now be required to enter your payment information such as name, address, and phone number. This information is for security purposes only and will never be shared. Fill it out and press Submit. 5) Within moments, your deposit will be accepted and the funds will appear in your account. Are you ready to earn your bonus money? 1. Click on the red Cashier Button in the top right corner of the lobby. 2. Click on the Bonus Account button on the left. 3. Click the red “DEPOSIT” button to make your first deposit. We recommend trying Visa or Mastercard, but other types of Credit Cards, Debit Cards and e-wallets may also be available. 4. After you have made a deposit, you can check how much you’ve cleaned off your bonus by clicking on “Bonus Account” again. 5. On this page you can also see your FTP point total. 6. It takes a total of 15,000 FTP points to earn your complete $600 bonus. Good luck at the tables! Full Tilt Poker also allows you to spread your 100% up to $600 bonus over the course of your first three deposits, in case you need to reload. Visit Full Tilt Poker now and get started clearing your bonus! Transferring money between your PokerStars and Full Tilt Poker accounts has never been easier. 1. Open your Pokerstars client and click on “Account” on the top menu bar. 2. Click on “Pair Full Tilt Poker Account”. Click continue. 3. Your passcode will appear in the next window. Click the “Copy to Clipboard” button. 4. Return to your Full Tilt Poker client. Click on the red “Cashier” button at the top right of the lobby. 5. Click on “Transfer to PokerStars” and follow the instructions. 6. Enter your PokerStars player ID in the first box. Paste your passcode into the second box by right clicking in the box and then hitting paste, or by clicking inside the box and then pressing ctrl+v. Press Continue. Press Finish. 7. The cashier transfer window will automatically appear. Enter the amount that you would like to transfer to PokerStars and then click “Ok”. Your funds should soon be available for use at the other side. Now that you have your account funded, you should find a cash table within your bankroll. 1) Once logged in, choose Real Money. 3) Choose Hold’em, or another game if you prefer. 4) Select No Limit, or Limit / Pot-Limit. 5) Choose your stakes, which is the buy-in level. 6) Click Play Full Ring Now or Play 6-Max Now. 7) A table will open based on your criteria. Choose your buy-in amount and click OK.
8) You’re now sitting at a cash game table! At a cash table you can leave whenever you want. Perhaps you would prefer to play in a tournament? We show you how next. It’s similar to find a tournament right for you. 4) Choose your stakes, which is the buy-in level. 5) Various upcoming tournaments within that buy-in level will appear. Choose one and click Register Now. 6) When the tournament lobby appears, click the blue button with the buy-in amount. 7) Once the tournament starts (MTT) or fill ups (SNG) you will be playing a tournament! There are hundreds of tournaments every day at Full Tilt – get in on the action now! Want to give the exciting world of Rush Poker a try? Here are some easy steps to get in on the action. 1. Click on the Rush poker tab in the FTP client lobby. Choose the type of game that you would like to play. 2. Choose a game to join, double click on the game of your choice to open its lobby. 3. In the new window, press the “Join Now” button at the top right corner. 4. Enter the amount that you would like to sit with for this game. Press “Ok”. 5. The countdown will begin and you’ll be dealt into a hand immediately. 6. If you receive a hand that you do not want to play, simply click “quick fold”. You’ll then be instantly moved to a new table for a brand new hand. In Rush Poker, you can focus on just the hands that you want to play. Quick folding allows you to play many more hands per hour, and every hand you play will be one that you actually want to play. Hand Histories are a record of a poker hand. They show all the information needed to completely reconstruct the hand. You can use them to show your bad beats, big wins, funny hands and more. The top players use hand histories for review to help improve their play. They often do this by posting hands in a popular poker strategy forum such as those on FlopTurnRiver.com. 1. Click “Options” on the top tool bar. 2. Click “Hand History” near the bottom of the menu. 3. Select the desired folder to save your hand history files into. You can do this by clicking “Change Folder”, navigating to a new folder. Press “Choose”. 4. Set the amount of days to keep hand histories at 9999 so you never lose any. Now click “Ok”. Congratulations! Now every hand that you play will be recorded and saved. This applies to cash games, Rush Poker, tournaments, sit n goes, play money tables, everything! This tutorial will show you how to take your hand histories and convert them into an easy to read format. Once they are converted, you can share them on the FlopTurnRiver forums, send them to friends and more. 1. On the game window, click the “last hand” button in the top left corner. 2. The Hand History window will pop up. Click on the Hand # that you would like to view. If you are looking for an older hand, use the buttons on the top right of this window to navigate to the hand you are looking for before clicking the Hand # link. 3. This text window is the “raw” hand history. Select it all by click + dragging across all the text, or right click then press “select all”. 4. Now right click and press “copy”. The raw hand history is now copied to your clipboard. 5. Open or switch to the FTR Hand Converter page. 6. Select the forum you want to convert your hand for. 7. Paste the text into the “Input” window on the left hand side. Do this by right clicking inside that field, and then clicking “paste”. 8. Press the button labeled “Convert the Hand”. 9. The converted hand history will now appear in the middle “output” window. Select this new text by right clicking, pressing select all. Copy it by right clicking and then pressing “copy”. Now your easy-to-read converter hand history is ready to share! Take it to the FlopTurnRiver forums or elsewhere and paste it into your message or post. Want to play for real money prizes without risking any of your own money? What you need is a Freeroll! 1. Click on the Tournament tab within the FTP lobby window. 2. Choose the type of poker (Hold’em, Omaha, etc) and type of game (No Limit, Limit, Pot-Limit) that you would like to play. 3. Check the “Freerolls/FTPs” box in the stakes window. Make sure all the rest of the stakes levels are unchecked. 4. Find a tournament where the buy-in is listed as “Freeroll”. Double click it to open the lobby. Alternately, or select it and then press “Go to Tournament Lobby”. 5. In the Freeroll tournament lobby, press the “Register Now” button at the top right corner. You’ve now signed up for this Freeroll tournament. You can minimize or even close the tournament lobby window. 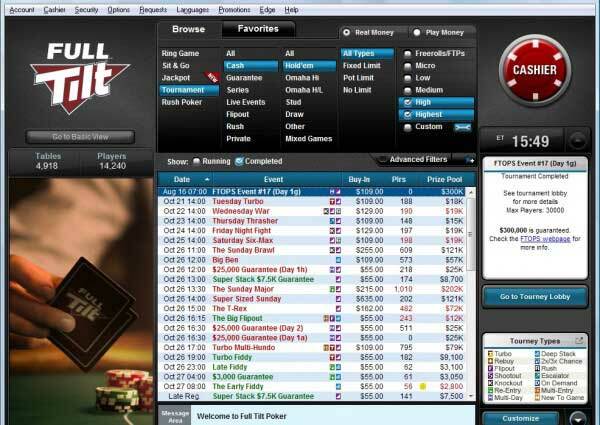 When the tournament starts, the Full Tilt Poker software will automatically open the table window for you. Good luck! There freerolls every day at Full Tilt. Join Full Tilt Poker today and get your piece of the freeroll pie! 1) Click on the red Cashier button. 2) Under Account Balance, you will see a column titled Full Tilt Points. You current points is in gold. 3) This number will increase as you play real money cash games or tournaments. Note that points are awarded when the hand is over on cash tables, and when the tournament has finished in MTTs or SNGs. These FTPs are used to clear bonuses, increase your Edge status, and purchase items from the Edge Rewards Store. EDGE is Full Tilt Poker’s brand new player rewards program. 1. Along the right hand side of the FTP lobby window, click “Show Widgets”. 2. Click “Customize” down at the bottom right. 3. Scroll down until you see “Edge Status”. Make sure all the boxes have check marks. Press “Ok” when you are done. 4. Locate the “EDGE” widget by scrolling up or down as needed using the arrows. The up arrow is located near the top of the side bar, the down arrow is located at the very bottom right of the window. 5. The EDGE widget will show your 7, 30 and 100-day averages. The higher your average, the higher your EDGE Status reward level will be. You can also click the “Open My Edge Page” to see more details about the program, and to see what your next reward will be. Cash in those hard earned FTP Points at the Full Tilt Store. You can trade points in for cash, bonuses, tournament tickets, ring game tickets or a special account security app. 1. Click on the red “Cashier” button at the top right corner of the lobby window. 2. Click the “Full Tilt Store” button. 3. There are 4 different categories of things that you can buy with your FTP points. You can navigate between these by using the category icons at the bottom, or through the “STORE” button at the top left. One of the biggest benefits to playing online poker is being able to play multiple tables at the same time. This tutorial will walk you through some settings that will help customize your gaming experience. 1. Click on “Options” on the top menu bar of the lobby. 3. Click on “Table Options”. 4. Here you can select different table options to help improve your game play and ability to play multiple tables at the same time. Cards: 4-colour deck” so you don’t accidentally misread five cards of the same colour as a flush. Gameplay Settings: “Auto-Rebuy by default” so that you don’t miss out on hands while rebuying chips. Table Settings: “Highlight Bet Amount” so that you can quickly and easily see the current bet amount. Preferred Seat: Choose the seat that you would like to always sit in. Click the various table types (9, 8, 6 and 2-handed) and click the seat you want to be seated in for each type. Buy-In Preferences: Here you can customize how much you automatically buy in and rebuy for in cash games. This will save you from having to type in an amount each time you sit at a new table. Custom Bet Buttons: Here you can customize your bet hotkeys. That way you don’t need to use the bet slider each time you want to make a bet. There are separate settings for pre-flop and post-flop betting. There are also separate settings for both No Limit and Pot Limit game types. Sound & Animation: This menu will allow you to customize the alerts you want to hear as well as the amount of animation. When playing multiple tables, it can be beneficial to lower the animation setting to improve software performance and maintain mental focus. If you need a break from your own action or just want to view your favorite players battle it out for thousands of dollars, here’s how to rail the high stake games. 1) In the Full Tilt lobby click on Options – Lobby View – Standard View. 2) Make sure you have “High” and “Highest” checked under the Stakes. This will ensure the biggest tables will appear. 3) Click on Stakes so the tables are sorted with the highest at top. You can then scroll through the tables and double click to view them. Make sure to check Hold’em and other games like Omaha – Full Tilt Pros Gus Hansen, durrrr and Isildur1 sometimes prefer Omaha or Mixed Games than Hold’em. Don’t wait, sign up at Full Tilt Poker today and get in on the action!